IPC 4101B – “Specifications for Base Materials for Rigid and Multilayer Printed Boards.” This specification generally covers the glass epoxy products though it was written primarily for copper clad materials. The base laminate properties are used widely in the industry for unclad glass reinforced products that are produced in sheet form. Norplex-Micarta’s G10, FR-4, and G11 products meet and exceed the criteria established and published in the IPC 4101B specification. This specification has been adopted worldwide due to its popularity amongst copper clad laminate manufactures and the work that the IPC has done to standardize many different specifications from various countries. 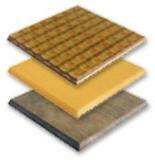 Norplex-Micarta is the leading manufacturer of high performance thermoset composite materials. We work directly with customers to manufacture the highest quality specialty sheet products, pre-pregs, rods and molded shapes, and tubes to meet demanding composite applications for our OEMs and fabricators around the world.